I've been on a sugar-free regime for some years now but sometimes I just NEED some jam on my whole grain yeast-free toast! 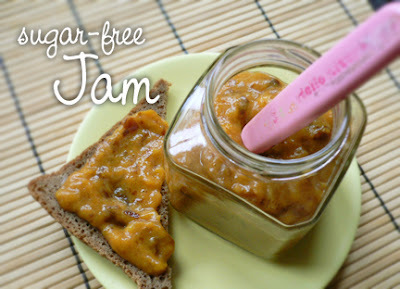 I've discovered that by taking dried fruit and soaking them in juice, just a quick puree will produce a naturally sweet, sugar-free jam that's even suitable for raw diets. Soak the dried fruit in the juice overnight, making sure there's just enough liquid to completely cover the fruit. Using a small food processor or wand-style hand blender, puree the mixture until smooth. That's it! Store in a jar, refrigerated. Why not try it on scones or pancakes with walnut butter! Makes about 1 cup. Pictured above made with equal parts dried apricots and prunes, soaked in orange juice. Great for all the doshas! But this jam sounds perfect for me! I am as you know half way into my agni-cure and I feel really tired so I've spent almost all day reading your blogg and there's even more to read! I want u to know how much inspiration, ideas and joy u give me trough your blogg! Sooo grateful!! May I know how long does this jam keep? Do we soak the dried fruits in the refrigerator? Weird question but...can I make this somehow without a blender? My roommate and I do not own one but I would really like to try this! Any tips? Otherwise, it may be time for me to invest...or at least get to know my neighbors and ask them! I think if you soak it long enough you can probably mash it with a potato masher or even a fork, but it'll be chunky (not a bad thing!) and may take a bit of elbow grease ; ) But in truth it's great to have a hand-held blender like this one -- great for everything from pureeing soups, making dips and spreads, even making nut butters. I'm sure you can find one at a garage sale or on Craigslist!